Please arrive to your first appointment 15 minutes early to fill out paperwork. Our receptionist will provide you with all the necessary forms and be available to answer any questions. You can download our Patient Information Form here prior to your first appointment if you wish to get a jump-start on the process. Your initial evaluation will consist of an interview and a physical examination. 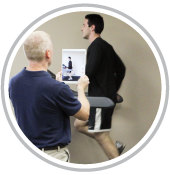 Your treatment sessions and evaluation should generally last 45-60 minutes. You may be asked to change into a gown or shorts to allow your therapist to obtain the most accurate information. You may want to bring your own shorts and shoes if being treated for your feet, knees, hips, or lower back. Women may want to wear a tank top or sports bra if being treated for their shoulder, neck, or mid-back. Once the evaluation is complete, your therapist will discuss their findings with you and describe the treatment plan. Treatment will be started during your first appointment if time permits after your evaluation. Typically, a home program will be provided at the end of your first visit.